I have used the term conflict resolver intentionally to reinforce the idea that human resource professionals and managers are instrumental in ending disputes, regardless of whether they are also mediators. These conflict management techniques are life skills that are useful in whatever setting you find yourself. With these skills, you can create environments that are respectful, collaborative and conducive to problem-solving. And, you’ll teach your employees to be proactive, by modeling successful conflict management behaviors. . 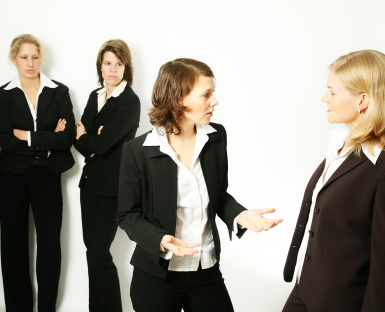 Since you re the go to person in your organization, it s natural for you to jump right in to handle conflict. When an employee visits you to discuss a personality conflict, you assess a situation, determine the next steps and proceed until the problem is solved. But is that helpful? How can I be most helpful to you? What are you hoping I will do? What do you see my role as in this matter? So what’s the difference? The distinction is acknowledgement. Your role is to help the employee gain a deeper understanding of her own interests and needs; to define concepts and words in a way that expresses her values (i.e. respect means something different to each one of us); and to make her feel acknowledged someone sees things from her point of view. Making an acknowledgement is tricky in corporate settings. Understandably, you want to help the employee but are mindful of the issues of corporate liability. You can acknowledge the employee even while safeguarding your company. Simply put, acknowledgement does not mean agreement. It means letting the employee know that you can see how he got to his truth. It doesn’t mean taking sides with the employee or abandoning your corporate responsibilities. Acknowledgement can be the bridge across misperceptions. That must be difficult for you. I understand that you feel _______ about this. If y happens, what s significant about that for you? Messages transmitted from one person to the next are very powerful. Sometimes people have to hear it from the horse s mouth . Other times, you ll have to be the transmitter of good thoughts and feelings. Pick up those gems, those positive messages that flow when employees feel safe and heard in mediation, and present them to the other employee. Your progress will improve. Be Resilient. Remember the last time you were stuck in a conflict? You probably replayed the conversation in your mind over and over, thinking about different endings and scolding yourself. Employees get stuck, too. In fact, employees can become so worn down and apathetic about their conflict, especially a long-standing dispute; they d do anything to end it. Yes, even agree with each other prematurely. Don’t let them settle. Mediation is about each employee getting their interest met. Help the employees see their movement and progress. Hopefully, you’ve discovered that these are your own habits in one form or another and that your organization is benefiting from your knowledge.